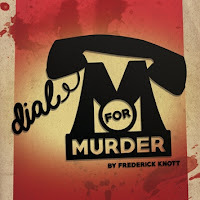 Dial M for Murder is a well crafted story that has been faithfully bought to the stage by Talking Scarlet productions. 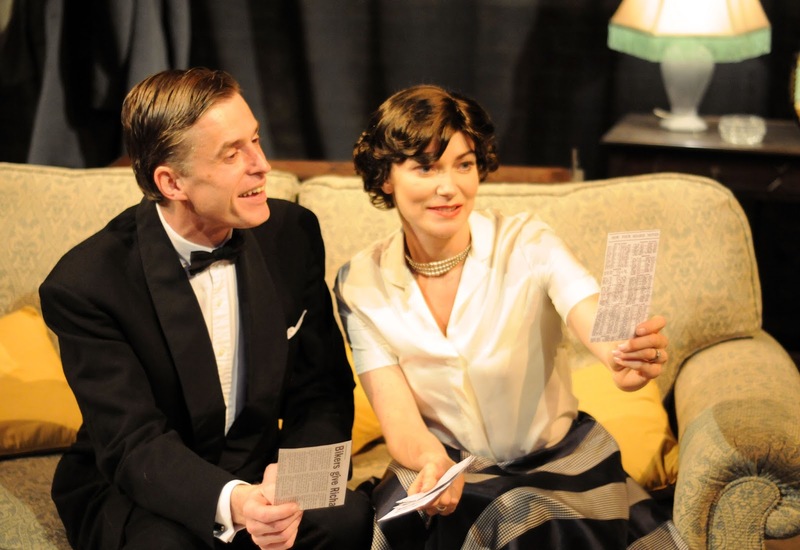 The Frederick Knott play started life as a BBC TV production before hitting the West End. Knott would then go on to write the screen play for the 1954 Hitchcock movie which was filmed in 3D. It is September 1952. Queen Elizabeth II has just become Queen, Winston Churchill is Prime Minister again and a successful murder conviction usually results in hanging. Tony Wendice is a former tennis star who married Sheila for her money. The love may have left the relationship but they are planning an evening at the theatre. To complicate matters, successful playwright Max Halliday arrives on the scene after a year in the United States. Max wants to pick up his affair with Sheila were it left off. In Knott’s play, Max writes murder mysteries for TV and so the show opens with the telling statement that he’d killed 52 in the past year. Tony invites an old acquaintance from school, Captain Lesgate, around on the pretence that he wants to buy a car. 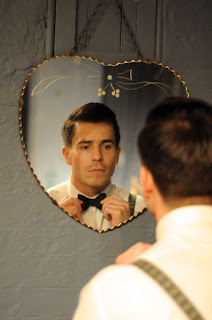 He soon reveals that he wants to have his socialite wife murdered and he has the perfect plan. This Patric Kearns directed show has both pace and the willingness to let the story develop. The action takes place over a couple of days and has a few twists but doesn’t descend to Scooby Do levels of silliness. The main leads are very engaging performances. Tony Wendice is played by Oliver Mellor, who is best known as Dr Matt Carter in Coronation Street. Former Hollyoaks actor Terri Dwyer appears as his wife, Sheila and the prolific Marcus Hutton is crime writer Max Halliday. Jolylon Young appears as Captain Lesgate. Special mention should go to John Hester who adds both humour and gravitas to the second act as Inspector Hubbard. 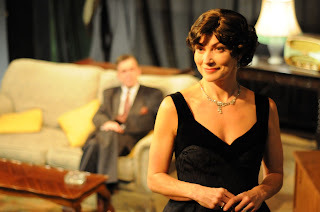 One of the joys of the theatre experience is seeing a good story that engages. Dial M for Murder is a gripping tale and one of the best that we have seen from Talking Scarlet. The production continues at the Mill Dam venue on Saturday 13th February at 7.45pm with a Saturday matinee at 2.30pm. Tickets for Dial M for Murder are £17 and are available from the box office on 0191 454 1234 or by visiting www.customshouse.co.uk.